I saw my first swallows of this season the other day. Swallows in the air, soil beneath my feet. Because that is what feel like the main thing these days; soil. Slowly but surely our garden is starting to take shape. We had a long weekend last weekend due to a celebration within the christian church. That church is quite present in our lives these days, even if we are not actively involved. The girls have their after school activities linked to it, my wife sings in the churchchoir. It has become my employer for (hopefully) the next six months and many social activities and festivities start there or are linked to it. But then I come home and spend much of my sparetime on my knees, hands in the dirt, digging, cleaning, reclaiming.... spade by spade.... I had to remove 2 young aspen trees and all of their roots... These were everywhere!! Not bad for 3 days of work, including relocating some berrybushes, lending a helping hand sawing twigs for stickpuppets and other work, but then again I did have help..... The soil seems rich, is nice and dark. Not sandy, but no heavy clay either. Firm, with loads of life in it. We spend a good deal of time looking at what we found; worms and ants and all sorts of grubs and larvae.... We need to get a book on those remarkable little creatures, so we know what we're dealing with. I did try our gasoline driven tiller. 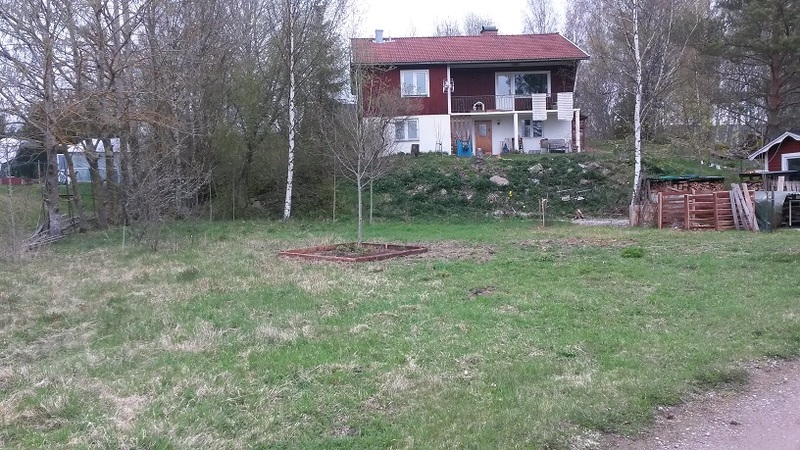 You can see the result to the left; a tangled mess of soil, grass, weeds and roots. I had to give it a go, but ended up with some severely aching shoulders. Should've know that controlling that machine as it bounced and ground its way through the garden would exert exactly the wrong kind of excess stress in the wrong places. Guess I'll be digging up the rest of the beds, all 9 of them, by hand as well. One of them is with Rex these days. He is maturing and he's getting more and more dominant, trying to rearrange the social order within the family... or at least the animals therein. His behaviour sometimes borders on aggressive and he really needs to be handled firmly quite regularly. Having other unneutered males around makes him act even more territorial and females in heat in the vicinity make it all the more challenging to coexist smoothly.... Despite the fact that he really has become much more socially acceptable with other people. One of the things to spend some of my first paychecks will be spent at the vets. He will be relieved of some weight between his hind legs soon! By then he will have matured and it will not affect his physical development all that much anymore. I found this great little book on sleddogs, their ways and how to use and train them. A new world is opening up with loads of potential. 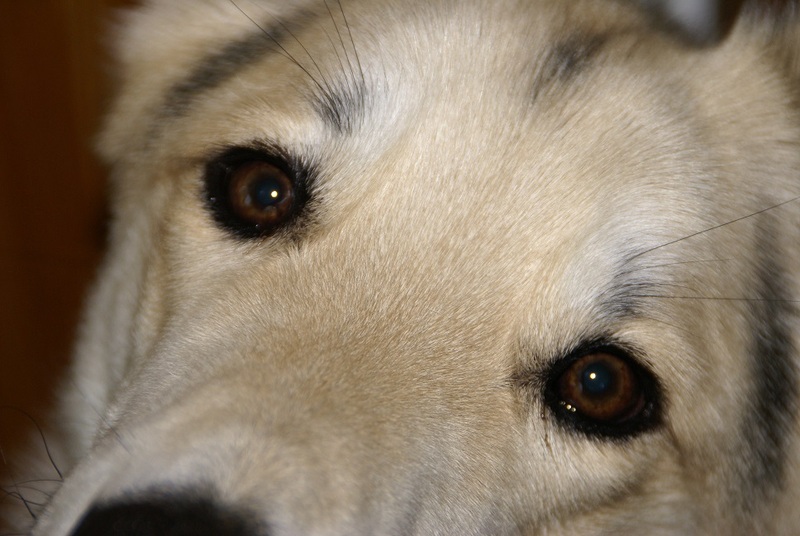 I think we will find ways to constructively incorporate our 4-legged boy into our family and beginning homestead. And it'll be a great way to spend time with him and the family in the slow period of the year; winter. We're also making more plans for the future. I called in a family meeting last friday to discus the possibility of having a small flock of sheep. Why? Well, it would mean a serious redesign of the chickencoop, since I figured it might be an idea to shelter both chickens and sheep under the same roof, even if being separated by a wall. or fence. They could keep each other warm and company during the winter months. As for grazing, there are a good deal of unused patches of meadows and grass around which would be useable when surrounded by some electrical wire. The meeting was called in to ask the kids if they were willing to chime in, since my wife and I can not do it all alone. The girls were all in favour, of course, but our son was sceptical. It would be a good way to teach all of us all about taking care of animals and for the kids about chores and responsibilities, but above all about life with other creatures. It seems like my life is in fast forward mode these days. Many things are happening all at once. 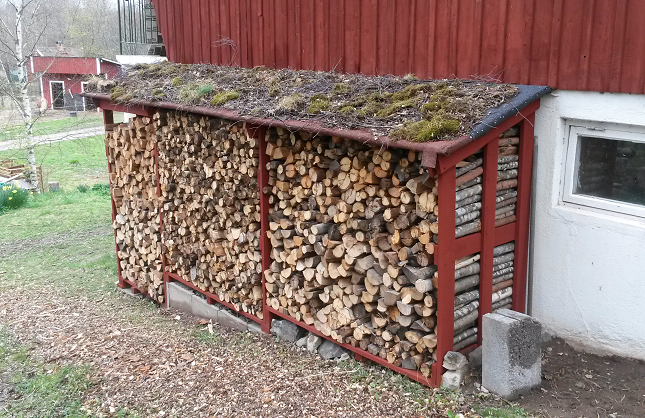 The new woodstorage is done and filled. The pile of wood and wooden pallets from the garden are processed and cleaned up. It looks like a garden again instead of a junkyard. After giving it some thought I decided to keep the aspen tree. I really like it. It is a beautiful species. And I like the sound the leaves make when there is wind. It sounds like running water. Plus they turn a gorgeous golden yellow in autumn. All flowerbeds are to receive such a framing to keep the compost and fertilizer around the plants and the woodchips on the paths. I laid on a layer of gathered gardendebris, like twigs, dry leaves and patches of moss. Occasionally I toss on a small patch of grass that I weeded out nearby, making sure some soil is still clinging onto the roots. Makes the whole thing look older, tones down the roof and hopefully will become a rooftop garden someday. Here's the patch that will be vegetable garden, some 20x20 meters. Little smaller actually. The slope in front of the house is full with comfrey, which spreads like wildfire, but is quite good as compostmaterial. And bees love it! 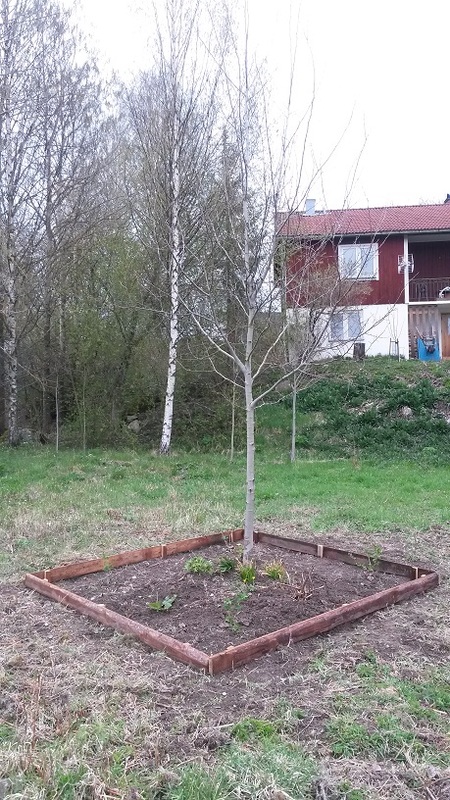 To the right the newly constructed compostcontainer, the choppingblock and a cherrytree.. Started my new job the day the full moon of may reached it's peak; may 4th. The anticipation of starting a new job, my first real, more than 1 month. 8 hour a day job since we moved here and the full moon did not make it easy to get a good nights sleep. And through a strange coincidence I got another backpack in my possession. Yet again old Haglöfs, but in new shape! No stains, wear or tear and not even the paint was chipped anywhere. 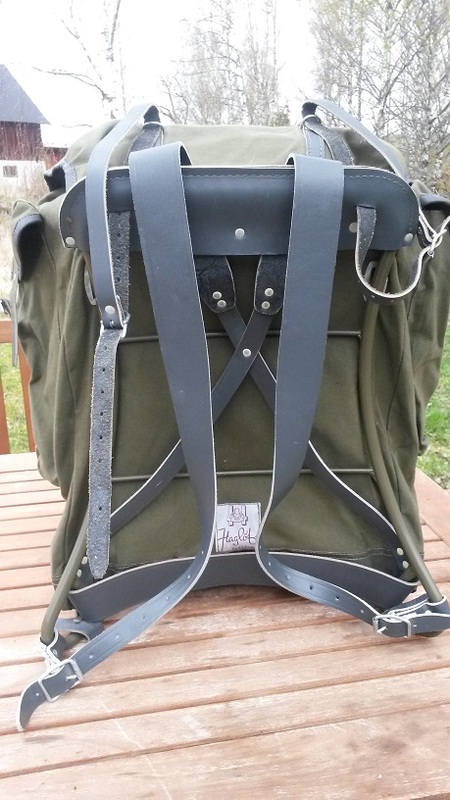 And it came complete with original top straps. This one however has one very neat feat. ; an in-build seat! 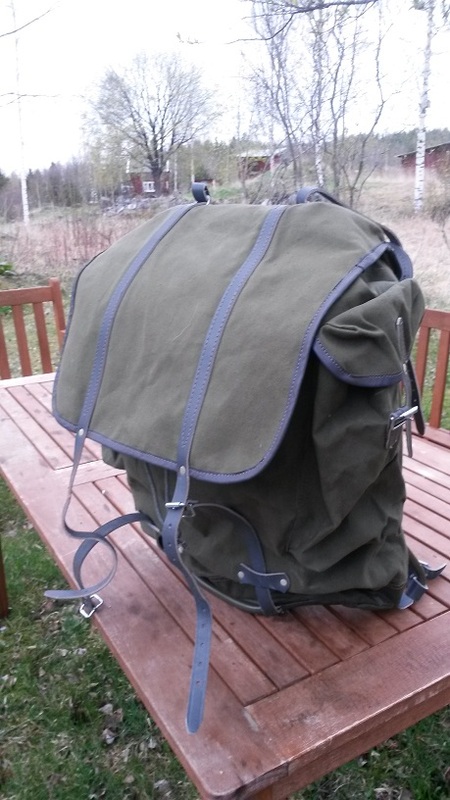 No, it is not one of those backpacks, where you have a (double) frame on the outside, that folds open. No this one has a neat little frame inside the pack, under the top lid! And a shaped foot of the frame so that it is quite stable. The main compartment seems bigger than the other one's I have and it has 2 side pockets. I'd like to tell you the story as to how I got it. I am a member of a group on facebook (yes, I know) that gives away things for free. The Swedish site has many of such groups actually. Second hand stuff for free or real cheap. Anyway, one of the members of said group was looking for a backpack for her younger brother, who wanted to start hiking. Always a good thing to stimulate younger folks into that area and I had a cheap knock off replica of a German army backpack (like the one I have) in touristcamouflage, meaning no real camouflage. I offered that one to her/him. 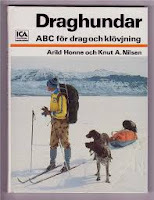 At the same time another woman offered her another backpack, said Haglöfs. I saw the pictures and told her I really liked that one..... In the end lady 1 wanted my backpack and lady 2 said I could have the Haglöfs for free. I told both we needed to go into town to do grocery shopping, so I could deliver and collect the backpacks. I was chuffed like a kid on christmas morning when I examined my new one!! and the specially bent frame provides stable footing. Winter's gone. Spring has officially begun. The old has been burned to welcome the new. I had a good day actually; being able to do it twice. The first time by myself, in daylight to literally remove the old to make way for new and the second time in good company, with songs and fireworks to say farewell to the old season. At the hembygdsgården there were large piles of wood debris and clippings, cut down branches and trees. These had to be removed to make way for enlarging an existing grasscovered parkingarea and even more importantly to enlarge an neighbouring garden that will be well kept and give joy. Right now the entire area is completely overgrown and the apple trees therein are in a serious state of neglect. They will be taken care of, so they will keep on bearing fruit again for everyone to pick. It was quite enjoyable, standing there, tending to the fire, piling up the wood- and plantremains, seeing it being consumed by the roaring flames. I guess it is the boyish joy of having a fire and to make it big... The crackling and roaring of the flames has a strange mind calming effect too and looking into the blaze I noticed something I never saw before. After a while, after the large centre mass of the pile had burned the main central flame became transparent and all along the edges, where the remains of the branches and such were not burned up yet, small, much darker flames rose straight up, encircling the large, almost gaslike flame. They hardly flickered or wavered, but were like small jetflames. Hard to explain, but a fascinating sight! Standing there I could not help but thinking what a waste it was too. Here I was, burning a lot of vegetational matter for no reason but to clean it up, while it could have heated a house for quite a long time too. The heat was intense and I saw the reason for that after the pile had mostly burned off. A number of logs, full grown trees lay hidden beneath it all and now they were burning a bright red and white; glowing embers and ashes. I had fun for a few hours, until the fire reached the bottom of the pit 1-2 meters down and practically everything was gone. Surprisingly little non-natural debris was in that huge pile. The fire at night was of a completely different nature; smaller yet brighter. This was a fire with a very different reason and nature. A fire deliberately made to see off the past season of darkness and cold and to welcome the new season of light, warmth and growth. 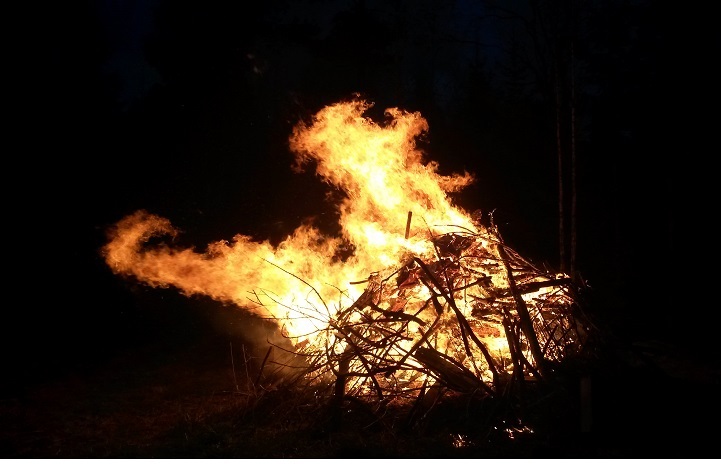 A fire with a very social function with songs, laughter and chatter. Meeting people, coming out of their winterburrows and strengthening weakened social bonds. 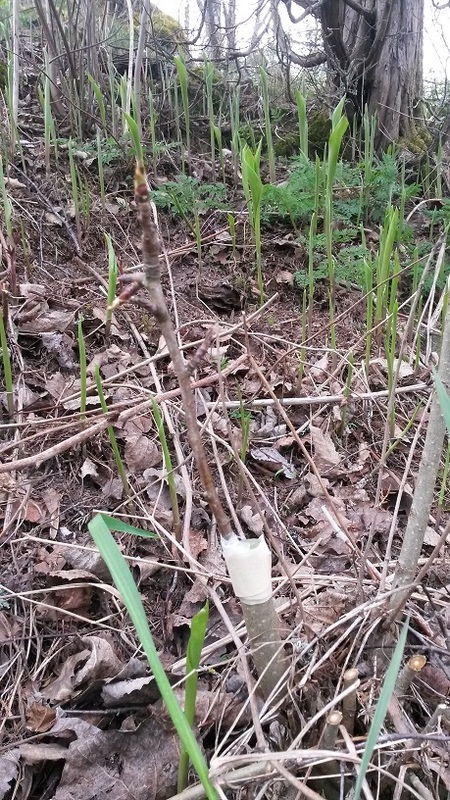 In between those 2 events I busied myself with something very new to me; inoculating plants. From one of the villagers we got a load of really good and tasty apples last autumn and I asked him if I could take some clippings from the appropriate tree. 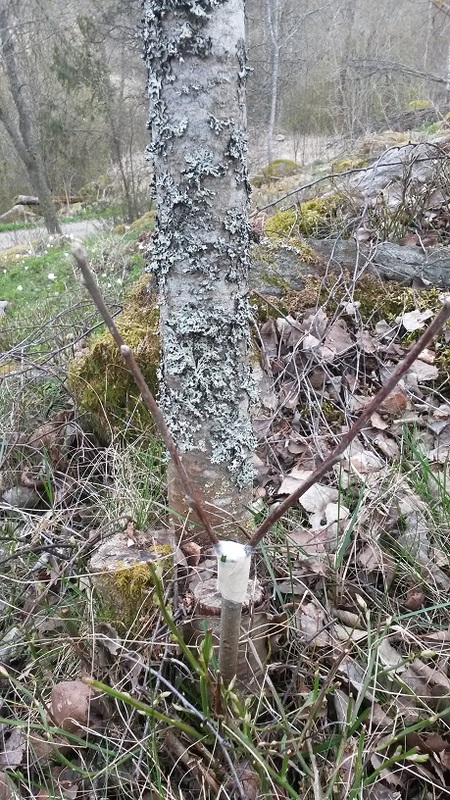 Odd (Skaukraft) and I have been discussing the possibility of inoculating apples onto a rowan-base, so that's what I wanted to try. 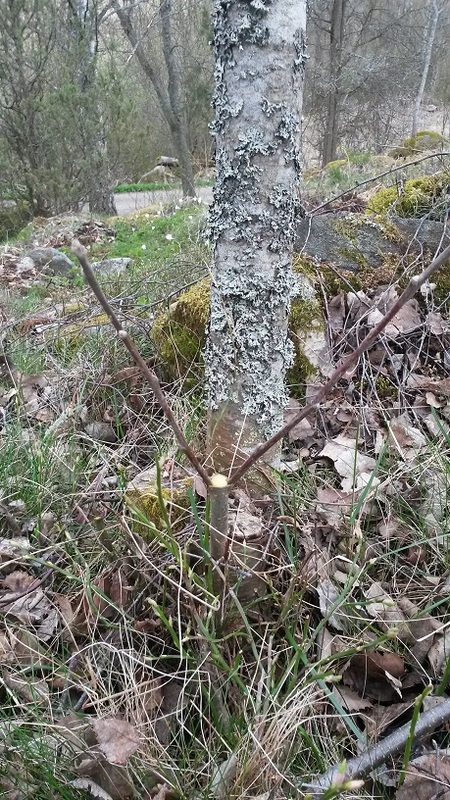 For safe measure I also made 4 cuttings from that tree and planted them directly, since I think it is a species, not a variety, so it should give a good tree. I do hope they will grow roots! From another villager I received some plums root offshoots. The parent tree is several decades old and does pretty well in her garden. if anything I could later on use it as a donor for other cherry- and plum inoculations, but I hope for good fruit. I also received a few clippings from a pear, which should do well on rowan too, according to her. Just to top things off I received 2 smaller marjoram plants and a handful of garlic and shallot bulbs, which had started to sprout and which, with any luck, will be the hosts for future crops of those. Speaking of which.... Much to my surprise the handful garlic cloves we planted 1,5 years ago resurfaced and are going strong! I'll leave them alone until autumn and then will see how much they yielded, before splitting them up and replanting them, along with the ones I got. It is a lot fiddlier work then I had thought, mainly due to the bark of the rowan not coming loose easy and me not having the right equipment. I made due with a pruning knife, ribbons cut from plastic bags and painters tape. I did get a blob of oculationwax, but read it can be made easily yourself as well by heating and melting spruce or pine resin and mixing it with beeswax. Here's a shot of one of the pear testcases amidst the upcoming lilies of the valleys. You can see the terrain I am working in; Rocks, boulders, mosses lingonberries, although the latter never bore fruit since we lived here. Same goes for the junipers by the way. Anyway I figured if rowan could take root here, it could also support a fruittree, since the roots have been established already. Planting a tree would be near impossible. So I am hoping to utilise this wild, unworkable piece of the garden this way. It now is home to 4 blackberries, gooseberry both white (1) and red (3), apple (1 double) and pear (2 single) if they make it, juniper (3 healthy ones) and lingon (all over) if they would bear fruit and all the while it just looks like a piece of forest with birch, rowan, aspen and birdcherry. I am told the rowanberry makes good winter chickenfeed, when dried. Speaking of changing times and opportunities; I will be starting my seasonal job next monday and that will create an array of other possibilities. Temporarily our financial room to manoeuvre will expand considerably and I want to take advantage of that by doing my hunter exam, which will license me to acquire and have hunting (fire)arms and to hunt legally. The plan is to hunt small game and leave moose to others. There's plenty of roedeer and hare around here. Grouse too and even beaver, if the damage they did last winter is anything to go by. And boars are ever expanding their territory northwards and have reached our region. Other things on the wishlist are schooling in the use of a chainsaw, because that means not only an accepted education here, but also the legal possibility to operate one anywhere and knowing what and how to do it. We also need to get accumulatortanks installed. We were kind of lucky with mild winters, but those tanks would mean a more equally spread and controllable warmth and warm water supply. I want to get a hydrophore installed too. That means having plenty of water at hand and a means to regulate temperature in the food cellar. I also want to see to it that our food cellar is fully equipped and stocked by the time winter comes. The same goes for the waiting wood fed kitchen furnace.